Real Housewives of Beverly Hills star Denise Richards is opening up about parenthood. During an interview with People magazine, published on Wednesday, Feb. 6, 2019, the reality TV star spoke candidly about her 7-year-old daughter Eloise's "developmental delays" due to a rare chromosomal disorder. "She wasn't able to sit up on her own for a very long time, and she didn't start walking until she was 2, and that was with physical therapy," Richards told the publication. 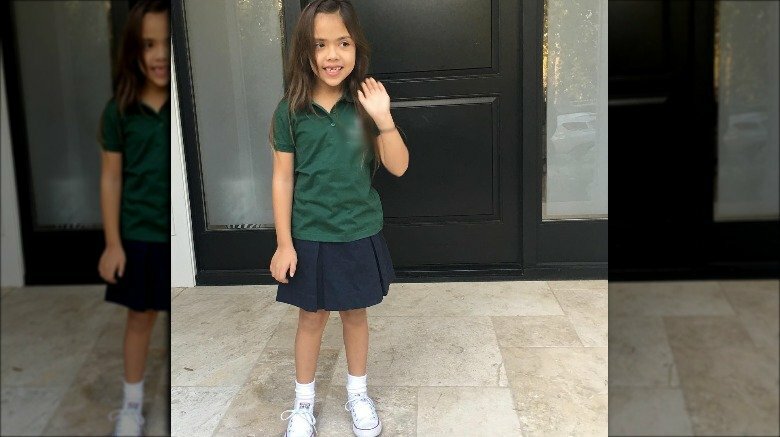 "She can only say a handful of words and there are times when she feels like her age in understanding, and then other times where it feels she's emotionally 3 years old." The Starship Troopers actress explained that her youngest child had received a deletion in chromosome 8 diagnosis in 2016. According to RareDiseases.org, the symptoms of this syndrome "may be extremely variable." However, it is "commonly associated with mild mental retardation" and "growth deficiency." While admitting that "it's been challenging," Richards said, "I'm learning every day because they don't really have a road map for her particular case." She went on to note, "Every child is different. You take care of your children no matter what is going on with them. I don't know if [Eloise] is ever going to talk like a typical child. But as a parent, you want what's best for your children, and you just do it." Well said. According to Us Weekly, Richards adopted little Eloise in 2011. "She's brought so much joy, and I love her to pieces," the proud mom told the magazine at the time. "She is a cuddle bug. She loves being hugged and held. She's such a beautiful little baby and little soul." While opening up about the adopting process, the actress-turned-television personality added, "Some people think if a celebrity wants a baby, they get one the next day. The adoption took two years, and there were times I felt discouraged, times when I got close to adopting a baby and it fell through. But I knew the right baby would find us." As Nicki Swift previously reported, Richards, 47, shares two other daughters, 14-year-old Sam and 13-year-old Lola, with ex-husband Charlie Sheen. The former couple officially split in 2006 after four years of marriage. Despite their ugly divorce, highly publicized child support battle, and sometimes difficult co-parenting relationship, the duo thankfully appeared to be on much better terms by 2017. "We've had a colorful year," Richards wrote on Instagram that January, captioning a sweet family dinner snapshot of her three kiddos and her famous ex sitting around the table. "At the end of the day we're still a family. 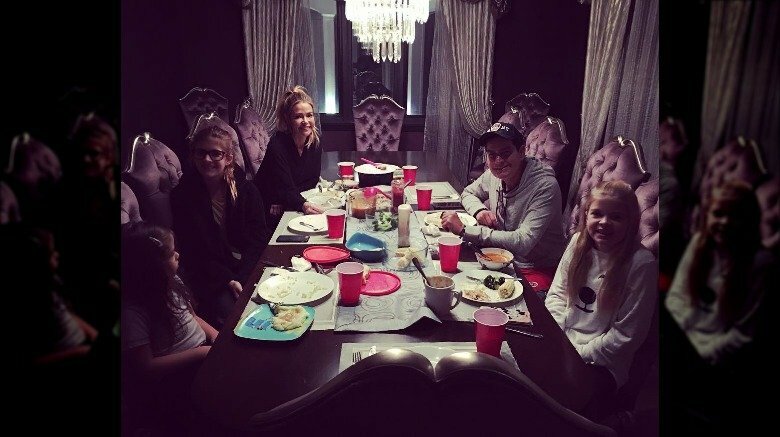 @charliesheen #familydinner." For the most part, however, this mom-of-three has understandably attempted to keep her personal life under wraps while focusing her time and energy on being a mom. As Richards recently told People, "I'm most proud of raising my kids, especially in a time that is very different from how I was raised. It's extremely hard to keep children grounded. This is not an easy time to grow up." Readers may already be aware that Richards recently tied the knot with actor Aaron Phypers during an intimate Malibu, Calif. ceremony in September 2018. "Yep, the rumors are true: This is my husband Aaron, and we just got married," the newlywed told The Daily Dish at the time. She continued, "I am so happy to officially be married to the love of my life. I can't wait for everyone to go on this incredible journey with me this season on The Real Housewives of Beverly Hills. It has been a wild ride so far!" Elsewhere in the Bravo sphere, Watch What Happens Live host Andy Cohen welcomed his first child, a baby boy, via surrogate just this week. "WOW! This is my son, Benjamin Allen Cohen," the new dad wrote to his social media followers on Monday, Feb. 4, alongside a sweet black-and-white photo of the father-son duo. "He is 9 lbs 2 ounces !! 20 inches !! Born at 6:35 pm, PT. He is named after my grandfather Ben Allen," Cohen, 50, continued his heartfelt post. "I'm in love. And speechless. And eternally grateful to an incredible surrogate. And I'm a dad. Wow." Soon after the exciting baby news broke, a number of the Bravo star's famous friends took to social media to congratulate him on becoming a father for first first time, including several of our Real Housewives faves. "Couldn't be happier for you @bravoandy welcome to the club .. can't wait to meet him," Richards herself wrote on Instagram at the time. Alongside a heart emoji, she added, "You're gonna be the best dad ever." Meanwhile, on the East Coast, RHONY star Bethenny Frankel wrote on Twitter, "Congratulations @Andy on the greatest love of your life Benjamin Allen Cohen!!! Baby you've got #BAC."